AC: "There are so many games in play here we can't even begin to describe them." 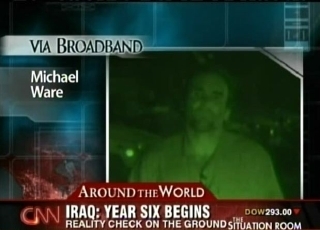 Erica Hill spoke to Michael earlier in the day, and he once again tries to sound-bite the complex situation in Iraq into five-minutes-or-less. TSR: "...what's happening is a consolidation of Iranian influence." 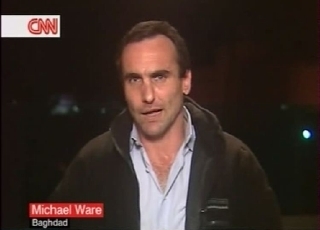 Michael is still in London, and talks to Wolf about the Basra violence and how it portends what could happen if US forces withdraw from Iraq. Basically it boils down to this: the Iranian-influenced Iraqi government is attacking Muqtada al-Sadr's Mehdi militia because he (Muqtada) is not in lockstep with Iran. Wolf also talks to Ed Henry, who gives a rundown of the current situation and then the president's version of it. 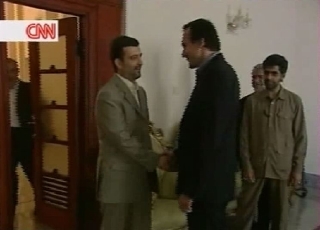 CNN/I: YWT: "The Iranians aren't making much of a secret of it." 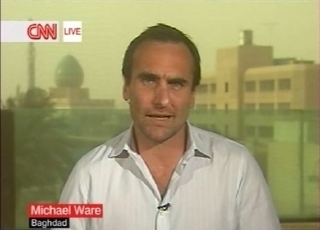 Michael speaks with Michael Holmes about the Basra fighting and how Iran is projecting its force into Iraq. 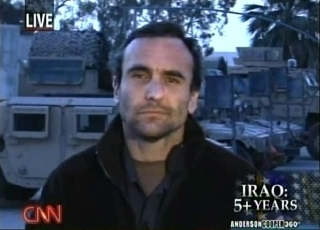 AC: "A window into the future"
Anderson has a recorded interview with Michael about the current situation in Iraq. And also reveals that today is Michael's birthday. 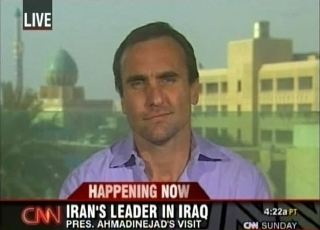 CNN/I: World News: "Right now we're seeing nothing but win/win for Iran and lose/lose for the US mission." 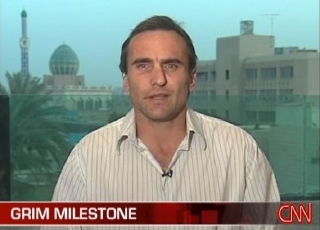 Michael speaks with Fionnuala Sweeney about the different factions fighting in Basra, how Tehran is pulling the strings, and why Muqtada al-Sadr declared the ceasefire to begin with. 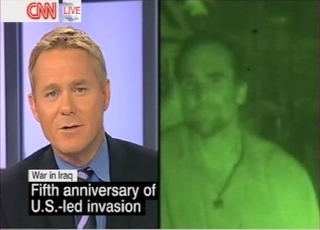 CNN/I: YWT: "A wonderful portal into a future of an Iraq without an American presence." 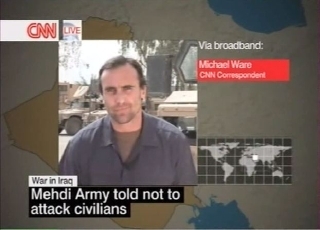 Michael talks with Jim Clancy about the events in Basra, how they are playing out, and why today offers us a glimpse of a possible future when American troops leave. 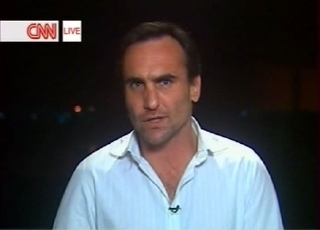 CNN/I: YWT: Today's violence in Basra "could be the future of Iraq." 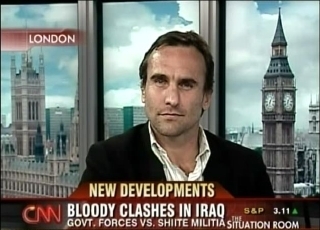 Michael is in London, and talks to Michael Holmes about the violence that erupted today in Basra. 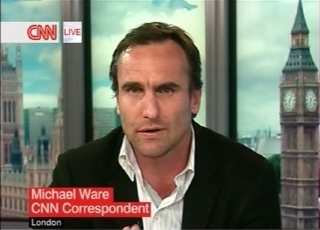 Thanks to Sharon for pointing out that CNN/I also had Michael on overnight -- this clip was taken from CNN.com. 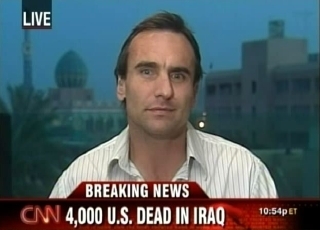 It's just before 6 a.m. in Baghdad, and Rick Sanchez asks Michael to comment on the US death toll in Iraq topping the 4,000 mark. 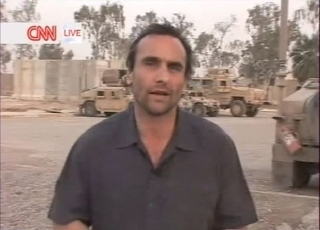 The woman who joins the conversation is Martha Zoller, one of three women Rick had been talking to about Iraq. She makes a valid point as far as not wanting to make the number more important than the lives lost (surely whoever was #3,999 is grieved for just as deeply!) but anyone who thinks that a milestone like that isn't going to be commented upon is just kidding themselves. 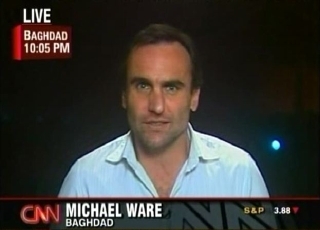 Michael appears via satellite to discuss the current situation in Iraq with Bill Maher. 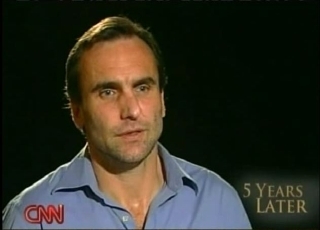 It's a fantastic interview; Michael at both his fun and serious best. 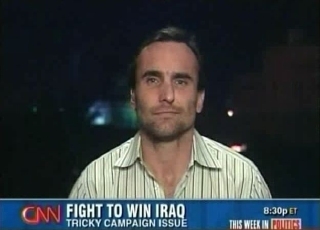 TWIP: "We all wish there was a magic wand that could be waved over this blood-soaked country..."
Michael appears on This Week in Politics to discuss the realities of whether the government in Iraq fears a US pullout and questions why no one is talking about Iran. 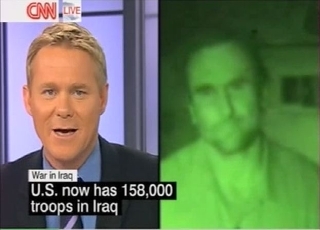 Another incredible special from the 360 team, Shock and Awe gave us a five year retrospective from the reporters who have been covering Iraq: the politics, the military, the birth of the insurgency, the surge, and the realities on the ground. These are just the portions that Michael contributed; the full special is available here. AC: "It's wafer-thin, the situation right now." 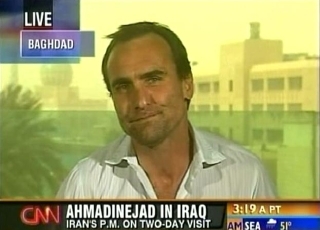 Anderson talks to Michael (it's morning in Baghdad!) and David Gergen about Senator Obama's stated intention to listen to the ground commanders about ending the war. TSR: "...America is fighting this war election to election." Wolf talks to Michael via the nightlighted (pretty sure that's the correct term, as "nightlit" would mean moonlight; whatever, he's green) broadband connection about the politics of ending the war. 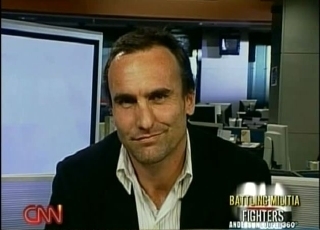 CNN/I: YWT: "...heavy cost and heavy consequences." A prepared piece about an Iraqi police officer who was tortured by fellow police. 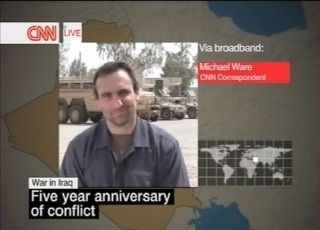 Michael interviews him and provides voiceover narration; like most things in Iraq, there are complicated questions raised by the facts of his story, including why it happened and at whose hands. 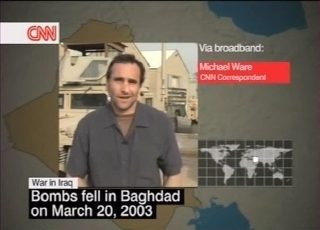 CNN/I: World News: "He perilously fails to mention some of the inherent risks and consequences..."
Michael reacts to President Bush's speech on the anniversary of the start of the war. The satellite feed is lost during this; they were unable to get back to him before the end of the program. 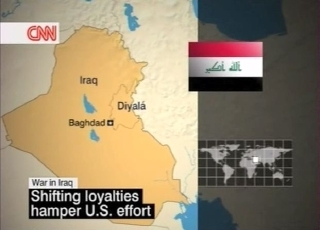 CNN/I: World News: "Is Iraq better off?" 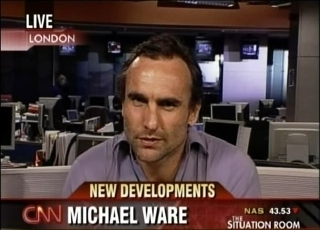 Michael talks about the changes since the surge began. 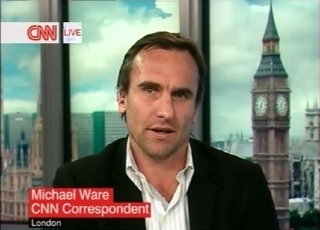 CNN/I: World News: "There's clearly been progress made..."
Michael talks about the improvements the surge has achieved, and the ramifications of the way they were achieved. 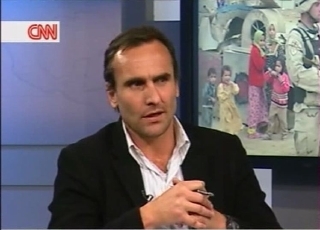 CNN/I: Business Today: "This country has been divided..."
Another report from the FOB: how well has the surge worked, and at what cost? 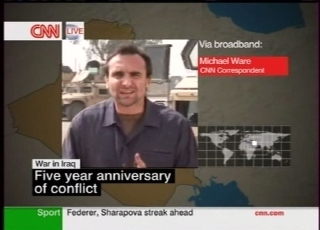 CNN/I: Today: "This war continues relentlessly..."
Michael is at a Forward Operating Base in the north of Baghdad and sends a report via broadband as CNN International begins to cover the fifth anniversary of the start of the war. 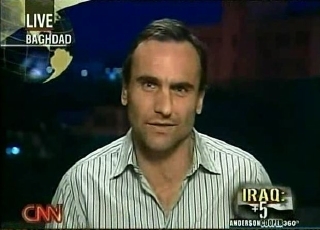 AC: "America is mortgaging the future...to bring these numbers down"
Soledad O'Brien subs for Anderson and talks to Michael as well as Peter Bergen and Gloria Borger about John McCain's latest trip to Baghdad. Michael does a voiceover-only summary of the trip. NR: "took less than 36 hours to essentially steal the show." 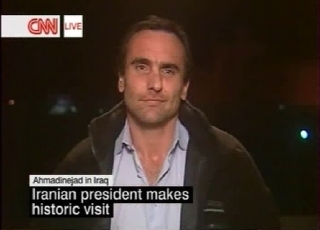 Don Lemon throws to Michael for a final summation of the Iranian president's trip. 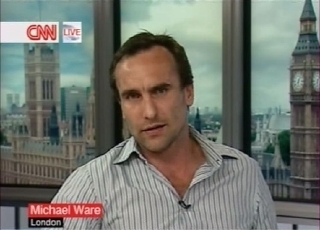 ...and both Michaels are still on for Your World Today, with a longer discussion about the visit and its importance. AAM: "the consolidation of long-standing arrangements." John Roberts asks Michael about Ahmadinejah's visit and whether he's really just there to stir up trouble. A recorded overview of the visit, including clips from the press conference. 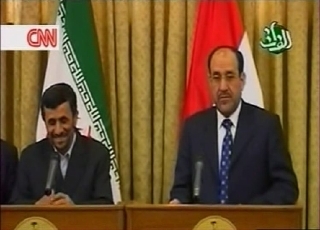 Another clip from World News, a summation of the significance of the Iranian president's visit. SAM: "This is a statement by Iran." 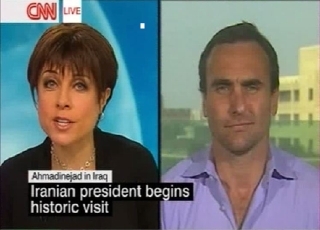 Michael is on Sunday Morning about 20 minutes after the International clip, detailing the significance of the Iranian president's arrival for Domestic viewers. Aneesh Raman also speaks about how Iranian citizens view the trip. 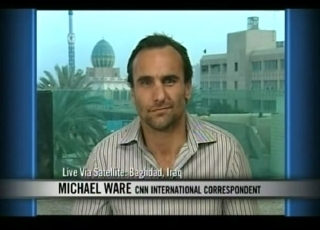 Michael appears on World News to discuss the arrival of Iranian President Mahmoud Ahmadinejad to Baghdad.